Hong Kong hosts a great many species of starfish. The list here includes only the real starfish and not the feather stars (crinoids) and brittle stars (ophiuroids). Owing to a exhausted fishery and extensive long-term trawling damage, some of the species mentioned here may be very rare now. Crown-of-Thornes starfish. Image by Michel Dammeron cc-by-sa 3.0. The crown-of-thorns starfish is a large starfish with many arms that preys on hard coral. Its name comes from the venomous thorny spines covering its upper surface – meant to resemble the crown of thorns put on Jesus before his crucifiction. This is one of the largest starfish and has a very wide distribution in the Indian and Pacific Oceans at tropical and subtropical latitudes where coral reefs or hard coral communities occur. The venom of the starfish contains so-called asterosaponins which have detergent-like properties. The brittle spines can perforate the skin of a predator or unwary diver and tissue containing the venom is lodged into the resulting wound. In humans this immediately causes a sharp, stinging pain lasting several hours, with persistent bleeding aided the venom as well as nausea, tissue swelling lasting for a week or more. Breaking of the spines means they become embedded in the tissue where they require surgically removal. The peppermint sea star can grow to a diameter of about 30 centimetres. Its arm tips and the central disc are bright red, while the other parts are paler, forming large plates. The color, plates and other features can be very variable and identification from photographs can be difficult. It feeds on encrusting spongess, detritus and small invertebrates. Occurs in shallow water in rocky environment, at a depth of 0 – 51 m.
Ranges in color morphs from dark or light blue, but also observed as aqua, purple, or even orange variations throughout the ocean. Grows up to 30 cm in diameter and has rounded arm tips. Some individuals can have lighter or darker spots along their arms. They are typically firm in texture and have slightly tubular arms with short, yellowish tube feet on the underside. It inhabits coral reefs and sea grass beds. They occur subtidally, sometimes intertidally, on fine sand or hard surfaces and move quite slowly . The cushion star has very short arms and an inflated appearance, resembling a pentagonal pincushion. Its colour is variable and it occurs in tropical warm waters in the Indo-Pacific. It ranges from Madagascar and the Seychelles to the Philippines, New Guinea, Australia and Hawaii. It feeds on detritus and small invertebrates, including stony corals. Luidia maculata (Seven armed starfish) taken in Ras Sedr,Egypt in 2012 by لا روسا (cc-by-sa 4.0). The diameter with arms is 12 – 20cm and it has 5 – 9, but normally 8 arms. The arms are long, rounded and tapered to a sharp tip. The tips bear small sharp spines on the sides. The underside is pale and the grooves along the arms bear large tube feet with club-like, pointy tips. The colours and patterns on the top side are variable from greyish blue, to brown and beige, but normally have a darker star-shaped pattern in the middle, and dark irregular bars running along the arms. It ranges from SE Arabian Sea, Persian Gulf, Maldive area, Ceylon, Bay of Bengal, East Indies, north Australia, Philippine, China and south Japan. Occurs inshore at depth from 0-134 m. Observations in Hong Kong include near Kau Sai Chai in Sai Kung and near Port island. It burrows in soft sediments and eats small invertebrates including other starfish. Distributed in SE Arabia, Maldive area, Ceylon, Bay of Bengal, East Indies, norh Australia, Philippine, China and south Japan. Lives inshore in tropical, Indo-west Pacific Ocean waters at depths from 0 – 50 m. Observed in Hong Kong from Tai Long Sai Wan, in sand substrate. A tropical starfish know from several locations including Hainan. 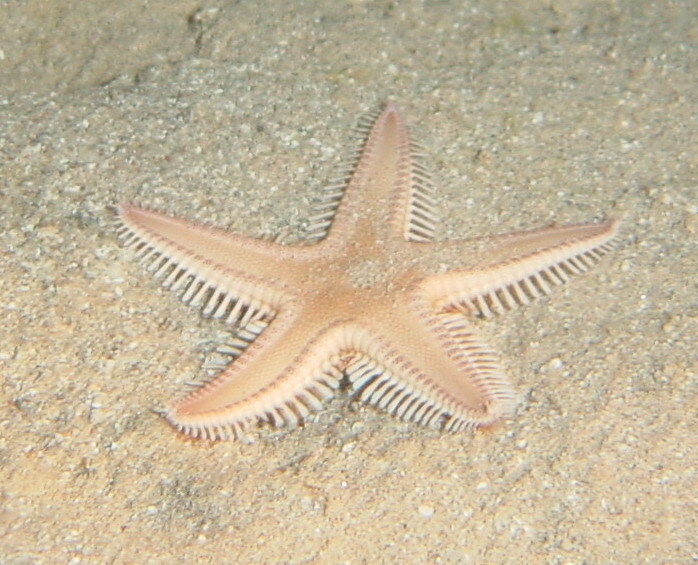 The Luzon sea star is prone to shed its arms, which then regenerate into new individuals. It is normally six-armed but often quite asymmetrical in appearance, because of it has a habit of shedding arms. Its colouring ranges from red to dark brown. It is found in the tropical and sub-tropical western Indo-Pacific region, ranging from Madagascar and the east coast of Africa to Northern Australia, Indonesia and the Philippines. It is found on both reef crests and in the intertidal zone where it feeds on bacterial and algal films that it extracts from the sediment. By shedding its arms for regeneration the species can reproduce asexually. The shed arm regenerates, growing a new disc and further arms. Up to 65 cm in diameter. Described as the new species Pseudarchaster spatuliger in 1934, it was later revised to an already known species. The diameter with arms is about 10 cm. It is a flat starfish with tapered arms. The edges of the body are bordered with large, wide plates giving it its english name. The tube feet are pointy and not tipped with suckers like other starfish. Occurs from the Bay of Bengal to China and southern Japan. The sand sifting starfish or comb sea star is a widespread species, found throughout the Indo-Pacific region in shallow tropical and sub-tropical seas (from the Red Sea and Zanzibar to Hawaii, and from Japan to Australia and New Zealand). The diameter including arms is up to 20 cm. The upper surface is dark purplish in colour and the underside is orange. Little pillars with flattened top on the upper surface are cream, grey or brown, sometimes making chevron patterns. Along the edges of the arms are long, sharp spines, with brown bases and pale tips. It spends its time buried in silty seabeds feeding on detritus and small invertebrates. Sometimes it also engulfs pebbles and digests the biofilm (bacterial and algal films) and small invertebrates adhering to the surface. It contains the potent neurotoxin, tetrodotoxin, also known as TTX which has no known antidote. In a case of paralytic poisoning in Japan it was found that the victim had eaten a trumpet shell, Charonia lampas, which had acquired the toxin through its food chain, thus implicating Astropecten polyacanthus. Indianastra sarasini – described as Asterina orthodon by Fisher in 1922, there is a record of it from “seaward side, Hong Kong, China, North Pacific Ocean” and another record from Broome, Australia. This starfish hides in the cracks at the base of the coral, but it is not found under the stones according to Taiwanese research.